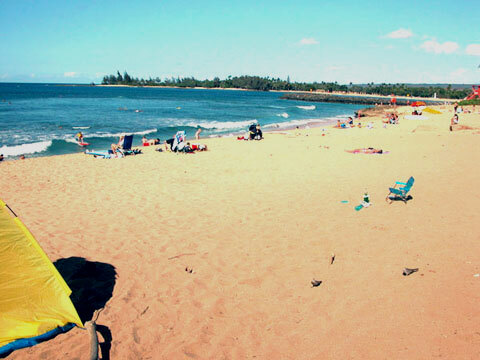 Aliʻi Beach Park consists of a main western section and a small eastern section that is wedged inside the Haleʻiwa Harbor breakwater. Care should be taken when swimming off the main steep, sandy beach due to the presence of rip currents and fringing reef and rock. There is a 300 ft long section of outcropping beachrock near the eastern end of the main beach, which can be dangerous. The beaches receive generally small waves, but there are several larger surf breaks located offshore. The small, eastern section of beach is protected by the harbor breakwater, making it a better location for inexperienced swimmers. There is a lifeguard tower as well as parking and bathroom facilities. Banzai Rock Beach Support Park, an undeveloped 2.3-acre park between Ke Nui and Ke Waena Roads, provides public parking and access to the beach and the surf sites offshore, Off-the-Walls and Rock Piles.